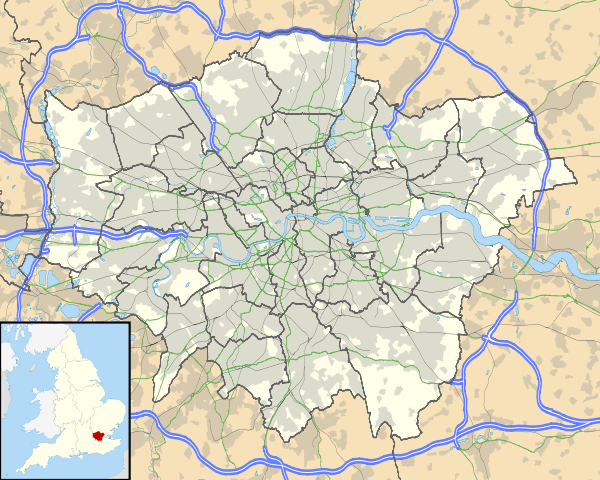 Greenford (/ˈɡriːnfəd/) is a large suburb in the London Borough of Ealing in west London, UK. It was an ancient parish in the historic county of Middlesex. It is 11 miles (18 km) from Charing Cross in Central London. Greenford is served by London Underground's Central Line and terminus for a branch of the GWR. The town is also served by another station South Greenford, which is on the Greenford branch of the GWR. Nearby places include Yeading, Hanwell, Perivale, Southall, Northolt, Ealing, Sudbury, Harrow and Wembley. The most prominent landmarks in the suburb are Horsenden Hill, 279 feet (85 m) above sea level; the small Parish Church of Holy Cross (14th century); and Betham House, built by Edward Betham (c. 1780). The name is first recorded in 848 as Grenan forda. 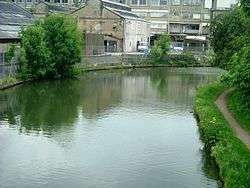 It is formed from the Old English 'grēne' and 'ford' and means 'place at the green ford'. 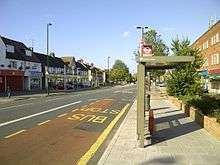 Greenford was known as Great Greenford in order to distinguish it from Little Greenford, which is now known as Perivale. The affixes 'Magna' and 'Parva' have also been used to denote the difference. Greenford is considered to be birthplace of the modern organic chemical industry, as it was at William Perkin's chemical factory in North Greenford, by the Grand Union Canal, that the world's first aniline dye was discovered in March 1856. Perkin called his amazing discovery 'mauveine'. Today there is a blue plaque marking the spot in Oldfield Lane North, just south of the Black Horse public house. Until 2013/14, Greenford was the home to the Hovis factory. The former Rockware glassworks on the canal is commemorated by Rockware Avenue. Greenford formed part of Greenford Urban District from 1894 to 1926 and was then absorbed by the Municipal Borough of Ealing. Post First World War, tea blender and food manufacturer J. Lyons and Co. were looking for a secondary site on which to expand production beyond Cadby Hall, Hammersmith. In 1921 they bought the first piece of an eventual 63 acres (25 ha) site, due to its location close to good transport links from both the Grand Union Canal and the Great Western Railway's Great Western Main Line, and the West Coast Main Line and onwards to the Midlands at Willesden Junction. The factory officially opened in July 1921, with the first single-storey buildings known as "Zig-Zag" due to their northern light-aligned windows allowing maximum light into the production area. There were steam and electrical power plants on site, which powered both the plant as well as the staff canteen and medical facilities, accessible to all plant employees and their dependants. Transport docks and a canal basin had been developed, allowing shipment of tea and coffee directly from London Docks into HM Customs excise controlled bonded warehouses. The extensive onsite railway infrastructure allowed precise positioning of heavy raw goods into the factory, as well as the extraction of finished product. Lyons bought their own steam shunters to move wagons between the GWR exchange sidings and the factory system. Lyons quickly became Greenford's biggest employer. A later pioneer in electronic machines and computing, Lyons deployed the latest factory automation technology, making Greenford a showplace that was regularly visited by the media, academics, competitors and royalty, with more than one visit by King George V and Queen Mary. In the 1950s, the site developed the breakfast cereal Ready Brek. Areas of the site not initially developed for factory use were landscaped, with many trees planted. As the factory developed these diminished, particularly after the development of the Lyons Maid Bridge Park factory in the 1950s, and the new administration block in 1971. After the merger of Lyons with Allied Bakeries in the 1980s, and the focus of the new Allied Domecq business to focus on spirits, with the sell-off of the businesses associated with the factory, the need for the facility dwindled. Redeveloped from 1998, today it is known as Lyon Way Industrial Estate. Five hundred yards north east from William Perkin's dye factory was a triangular field in which he kept horses. On this ground was built the Oldfield Tavern public house, which became a popular venue for a rock group called the Detours, who met a drummer there called Keith Moon. On Thursday 20 February 1964 they were introduced to the audience of the Oldfield Tavern as the Who. (The tavern has not survived, however, and has since been replaced by a small block of flats and a Texaco petrol station). Andy Locke, Dave Kerr-Clemenson and Wal Scott were all in Edison Lighthouse, and with chart-topping Love Grows all came from Greenford. The A40, a major dual-carriageway, serves the area. Sudbury Hill station, on the Piccadilly Line. Greenford station, on the Central line. Greenford station, on the First Great Western. South Greenford railway station, on the First Great Western. Greenford has the following bus routes travelling through it: 92, 95, 105, 282, 395, 487, E1, E2, E3, E5, E6, E7, E9, E10, E11, H17 and N7. The grounds of the former Ravenor Farm has become Greenford's largest park. It is the venue for the annual Greenford Carnival, which is held every July. Until 1910, the land that formed Ravenor Farm/Ravenor Park was a detached part of Northolt parish, with the tithes to the land going to St. Mary's Church, Northolt and not the Greenford parish of Holy Cross. The former Ravenor Farm buildings in Oldfield Lane South are now home to the London Motorcycle Museum. There are also the Northala hills near Northolt. The trotting track at Greenford was a pioneer speedway venue and open meetings were staged 1928–1930 . The track would be called a long track now, as it was of the order of half a mile/800 metres per lap. The trotting park was situated on what is now Birkbeck Avenue, just north of the A40 Western Avenue. 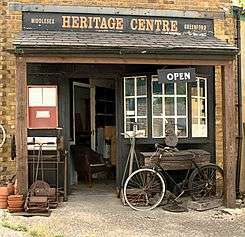 Greenford Heritage Centre: a cornucopia of British-made domestic paraphernalia of 20th century is on display - a variety of household items that were commonly found in British homes and gardens in the past. London Motorcycle Museum is the capital's only motorbike museum, opening in 1999 with a display of around 60 exhibits and now have around 200 exhibits on display including a wide range of bikes & memorabilia as well as knowledgeable staff. Significant local businesses include: British Bakeries, IBM, Aurora (TV Lighting), Panavision, Panalux, Wincanton (Distribution Centre) and Royal Mail (Regional distribution centre). KBR has an office in Greenford. Greenford is part of the Ealing North UK parliamentary constituency, represented since 1997 by Labour MP Stephen Pound. Greenford is made up of three and a half electoral wards for local council elections: Greenford Broadway, Greenford Green, North Greenford and half of the Lady Margaret ward, which is situated on the south side of Greenford Broadway. These wards all elect councillors to Ealing Council. Ealing Council is currently run by a Labour administration. Greenford is in the London Assembly constituency of Ealing and Hillingdon which has one assembly member: Onkar Sahota (Labour), who was elected in May 2012. Sculptor C. J. Allen (1862–1956), a figure in the New Sculpture movement, was born in Greenford. Tennis player Blanche Bingley (1863–1946), six times women's singles champion at Wimbledon, was born in Greenford. Model Jourdan Dunn was born (1990) and brought up in Greenford. Pop singer Elyar Fox was brought up in Greenford. Comedian Freddie Frinton (1909–1968), who remains a household name in Germany and Scandinavia, lived in Greenford. Jack Good, pioneering music TV producer with links to artists including the Beatles and the Monkees, was born in Greenford. 19th century actor Charles Kean (1811–1868) grew up partly in Greenford. David Kerr-Clemenson - bass player with Edison Lighthouse, White Plains and Fast Buck - lived in Hedgerley Gardens, Greenford for twenty-two years. Singing sisters the Nolans attended the Cardinal Wiseman School in Greenford. Drummer Doug Sandom, Keith Moon's predecessor in rock band the Who, lives in Greenford. Lieutenant General Sir William Thornton (1779–1840), a leader of the Light Brigade, lived in Greenford. Jason Roberts, professional footballer, attended the Cardinal Wiseman School in Greenford. Steven Warner, eponymous star of The Little Prince, was born in Greenford. ↑ Bradbury, Poppy. "Hovis to close Greenford distribution centre". Get West London. Retrieved 2015-12-24. 1 2 3 4 5 "The First Food Empire: A History of J.Lyons & Co". Peter Bird. Retrieved 2012-01-21. ↑ Archived 25 April 2012 at the Wayback Machine. ↑ "Welcome - William Perkin C of E High School". Williamperkin.org.uk. 2015-05-18. Retrieved 2015-12-24. ↑ "Ravenor Primary School | Reasoning - Responsible - Resilient - Resourceful - Reflective". Ravenor.ealing.sch.uk. Retrieved 2015-12-24. ↑ "Horsenden Primary School". Horsenden.ealing.sch.uk. 2015-07-11. Retrieved 2015-12-24. ↑ Ealing Council Greenford Carnival. ↑ Ealing Gazette (2008-09-19) http://www.ealinggazette.co.uk/lifestyle-ealing/listings-ealing/2008/09/19/what-s-on-at-greenford-64767-21857258/ What's on at Greenford. ↑ "Locations." KBR. Retrieved on 13 January 2008. ↑ "Most popular people born in Greenford". IMDb. Retrieved 12 September 2014.